WHY DO SHORT ANTENNAS NOT PERFORM WELL? AUTOCOSTRUZIONE DI UN TRASMETTITORE "VERA AM"
QUANTA POTENZA EROGA EFFETTIVAMENTE IL MIO APPARATO? 6 metri: una banda veramente dura! The call I0JX, having a 2-letter suffix, belongs to the first series of callsigns issued in Italy after WWII, when amateur radio became legal. Such short calls are not reassigned when becoming available. I have counted that about 290 short calls ("1-by-2" or "2-by-2") are currently registered in Italy (out of the theoretical maximum of 676), and I have estimated that less than one third of them still have some interest for ham radio. By the way, if you are interested in the Italian callsign system, look at my page providing a quite comprehensive overview on this topic. I also have extra-class license in the U.S., where I could obtain the matching call K0JX thanks to the vanity call program. Many people say that amateur radio is going to gradually disappear, but, despite that, I must confess still feeling myself very committed to radio in general. 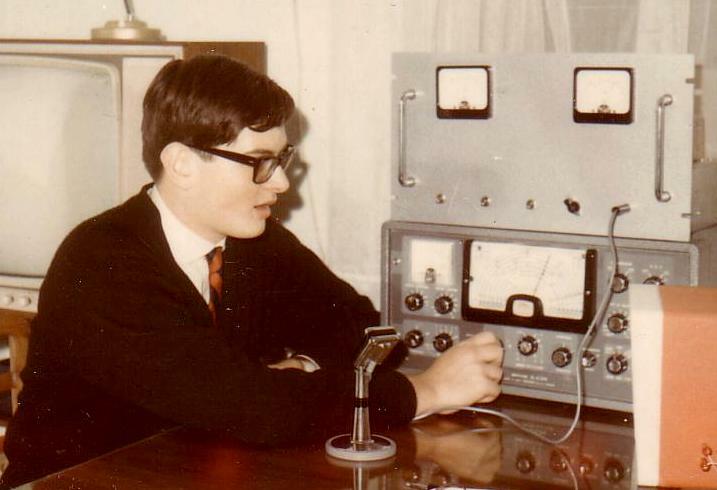 My radio career started in 1964, at 17, with an home-built 10W VHF AM transmitter (one QQE03/12 - 6360 modulated by a push-pull pair of EL84s - 6BQ5s) and a Geloso G. 4/214 receiver hooked up to a nuvistor converter. I occasionally wonder whether devoting so many personal resources to ham radio makes real sense, but then I take comfort in the words of an old and good friend who often reminds me that: quitting amateur radio after so many years would mean having wasted a substantial part of lifetime for nothing. In fact, why quitting? I believe that the amateur radio community is and will remain quite an unbeatable example of human fraternization. Can one expect that the ever growing crowd of Internet hobbyists will succeed in recreating, on a worldwide basis, the strong inter-personal feeling which radio amateurs were able to achieve? Probably not, as they often only have a common tool, and not also the common interest that hams instead have! Having started as a boy in the vacuum tube era, a huge tube pinout database is still today imprinted in my mind. Even though I cannot remove that old stuff from my head, some room still remains for playing with PCs. I started in the Apple II era (1983) with some logging and antenna tracking software and later, in the "IBM-compatible" era, I did some Microsoft Visual Basic programming, easy to manage without being a computer nerd. In particular I wrote ClusterMaster, a packet- and web-cluster program that can be still updated by uploading the most recent ITU prefix and DXCC country files. The new South Sudan (ST0) DXCC country is now included. I was, and to some extent still am, an avid DXCC hunter, having all DXCC countries confirmed. 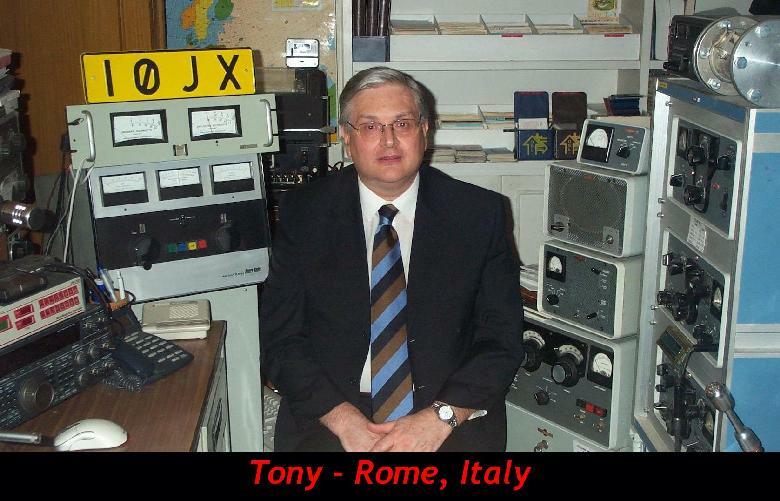 I have also participated in many contests, twice achieving world top-scorer in the ARRL CW contest on 40 meters. Most of my operating is CW, the only mode which, in my opinion, still makes sense for radio practitioners today, all other modes appearing obsolescent to me when compared to modern communications technologies (this is a long debate, not for this page). So, despite having a fairly modern station, I still sometimes use a Drake C-line or a Collins S-line. Moreover, I have plenty of old equipment giving me the feeling of the good-old-days, including some Geloso radios which I mainly use on AM. All hooked-up and readily operational. The "magic band" (6 meters) is the one I like most. Lot of listening and just a few QSOs (apart from the sporadic-E season), but a lot of emotion too. We are now at the peak of a (poor?) sunspot cycle, and 50-MHz QSOs with the Pacific area will hopefully be again possible, as they were fairly common in years 2000 - 2002. As of July 2014, I have 241 DXCC countries, 44 US states and 36 CQ Zones confirmed, see my 50-MHz DX log. I operate six-meter (50.004 MHz) and four-meter (70.088 MHz) beacons which are located at my business QTH. I am an electronic engineer managing development activities at a company dealing with satellite payloads & digital hardware design and prototyping. Married, with one daughter (38) and one son (35).